This entry was posted in Economics, Federal Reserve, Finance and tagged central banking, economic theory, economics, finance, inflation, interest rates, Keynes. Bookmark the permalink. If a country is poor it has plenty of high return investment opportunities ahead of it. And the same time, the opportunity cost of saving (starvation) is high. Put another way, savings at a given interest rate is very low, while demand for investment at a given interest rate is very high. The result is that interest rates consistent with full employment are probably very high. If you set risk-free rates too low then borrowers would jump on the opportunity to borrow and invest at these high returns, while savers would hardly save anything. The result is that far too little money is saved at full employment, while far too much money is borrowed and spent. In other words, borrowing exceeds saving by a large amount. This gap between savings and borrowing at full employment is filled by the fractional reserve banking system (newly created money) or declining cash hoards. In other words: the result is too much spending and rampant inflation. 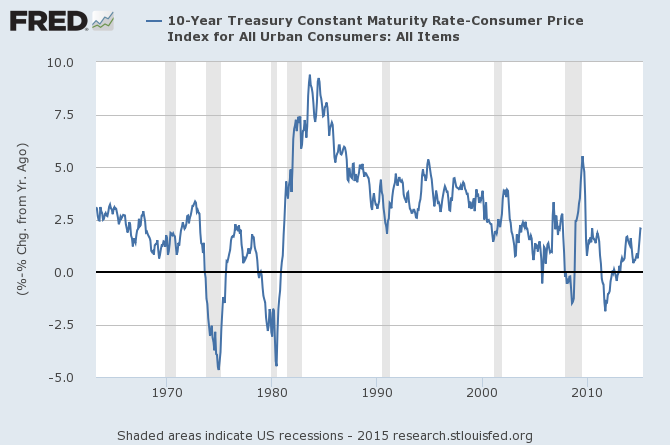 The question is always: what interest rates balance saving and borrowing at full employment? The preference for saving and borrowing are always changing based on circumstances, and so is the ideal risk-free interest rate (that leads to full employment and stable inflation). So if you anchor rates at a real rate of zero then there’ll be times when you experience inflation as a result. Which also lays out a new monetary system which would make it unnecessary to centrally plan interest rates, while also removing capital providers’ grip on the economy. I hope I haven’t misinterpreted the post. I’d like to propose another mechanism. What about interest being the reward the lender gets for the job of allocating scarce resources (capital)? The current problems have arisen from the fact that the system no longer works properly, investors have become rentiers – just as you said. They no longer adjust interest according to the perceived risk associated to a certain venture, they just ask a monopolistic fee for the privilege of using a resource that has been hoarded by those very rentiers. In a way it is a historical turn back to a sort of feudalism. In those times the lords controlled the land, nowadays the rentiers control the flow of money. We can remedy this situation very simple. All we need to do is to remember that real capitalism is a lot more about mutual trust than about mere money. Interest rates are the reward the lender gets for the job of allocating capital. That requires risk. Positive real interest rates in a risk-free market like lending money to a government which controls its own currency are nothing more than rent. Risk is not the only thing that determines interest rates. Consider also the possibility no one wants to save at a 0% real rate (or not enough people). They value a dollar tomorrow less than a dollar today. In this case, borrowers need to first pay savers to defer spending, and then on top of that pay them for risk. If you only pay them for risk, then no one will save, except those savers that value a dollar tomorrow at least as much as a dollar today. Those savers who value a dollar tomorrow more than a dollar today would be happy saving at an interest rate less than what would compensate them for the risk. In the sense that I fully agree with Aziz. Also we’d better remember that money is more of a (very useful) tool than a worthy goal. Betterfailling I think you’d be interested in the system I propose in my book (see comment above). It does exactly what you desire: turns money into an instrument to facilitate trade. It can no longer be accumulated as wealth. I’ll try to lay my hands on it – living in Romania complicates things a little bit – but I don’t think I’d go that far as that. Rather than a new set of laws we need a new kind of attitude towards things. I’ve read some place that Israel is not that much the Chosen People but the People who has chosen (a new way of life). How about us making the same thing? Choosing another economic paradigm, just as Dan Price has done. Not giving up wealth altogether, just spreading it around a bit – for the ‘better good’ of us all. As it happened when Ford had jacked up the wages in his factories. Like it or not the market is a lot freer that it was 100 years ago. If the deals are not perceived as being fair those involved will gradually opt out, in various forms. Everybody will suffer from this.